Madison Bumgarner has quietly become one of baseball's best and most consistent pitchers. He may not do it with a lot of flash or dramatics, but he gets the job done. 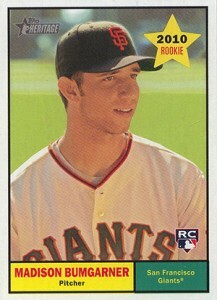 Similar is the case for Madison Bumgarner cards. They're definitely solid but they largely hover in the background behind the game's bigger stars. And maybe that bodes well for the future. 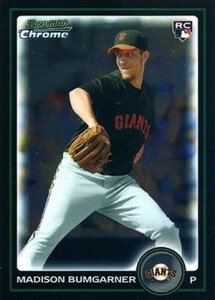 Shop for Madison Bumgarner cards on eBay. 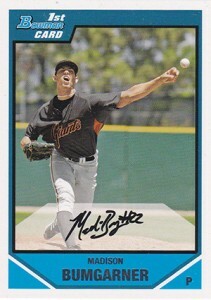 The first Madison Bumgarner cards came in end-of-season Bowman products in 2007. 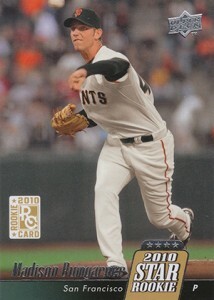 He has base and Chrome cards in 2007 Bowman Draft. 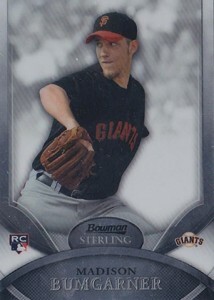 He's also on the Prospect Autograph checklist in 2007 Bowman Sterling, his first signed card in a Giants uniform. 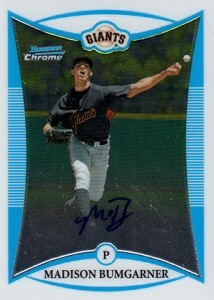 There is also a Bowman Chrome Prospect Autograph in 2008 Bowman Baseball. All of these cards, and others released between 2007 and 2009 are not rookie cards, though. They're either inserts or they're part of minor league sets. 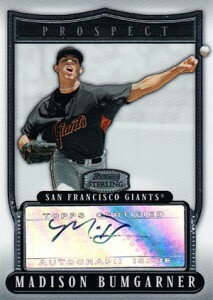 That said, Madison Bumgarner's various 2007 Bowman and 2008 Bowman Chrome autograph are all very popular and treated by many like rookies. 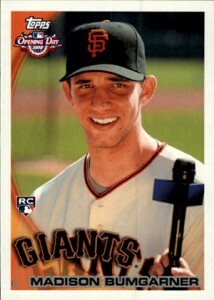 Madison Bumgarner rookie cards are in several 2010 products. This was the first year of Topps' MLB exclusive, although that didn't stop Upper Deck from producing one set. 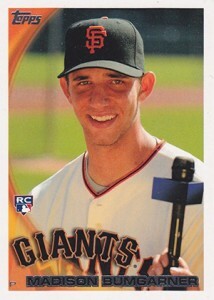 For the most part, all Madison Bumgarner rookie cards are very affordable. Things get a little more pricey when you start looking at some of his rarer inserts and parallels. 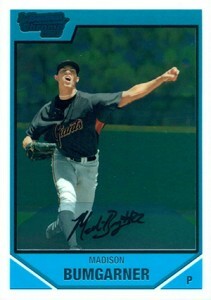 Just one of the pitcher's rookies is autographed -- 2010 Topps Finest. 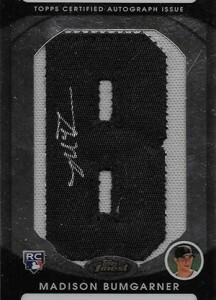 His signature is done on a manufactured letter patch meant to look like what you'd see on the back of a jersey. There are variations for each letter of his last name. All are numbered to 106 so there's nearly 1,000 total copies in the product not counting parallels. 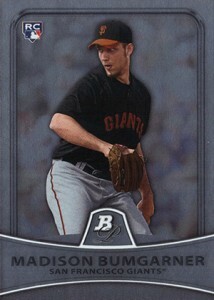 The only other set from Bumgarner's rookie year to have his autograph is 2010 Topps National Chicle. The card is an insert. A multi-time World Series Champion, Madison Bumgarner has assured a place in the San Francisco Giants history books. The world, and the hobby, took notice following his historic MVP performance during the 2014 Fall Classic where he won three games. How far will his status grow in the collecting world? Bumgarner has a lot more baseball left in him so it's tough to tell. Because he's a pitcher, collectors should always be aware of the risk that comes with the position. Careers on the mound can be quickly derailed, particularly in a hobby where players are expected to always be improving. Right now, prices might very well be at their peak as it's going to be tough to top the 2014 World Series. 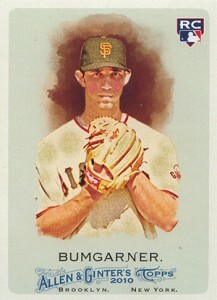 That said, outside of a few top exceptions, Madison Bumgarner's cards aren't wildly expensive. 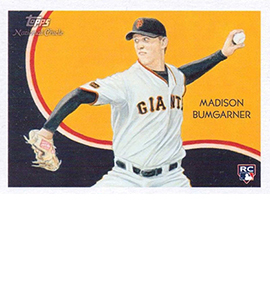 Below is a gallery with all of the Madison Bumgarner rookie cards. We have also included his top prospect cards that pre-date his rookies. See a card you like or want to track values? Click on the links or images to browse on eBay. 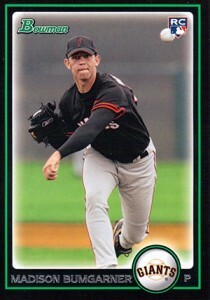 The following is a list of key Madison Bumgarner prospect cards. These are not considered rookie cards as they're inserts.